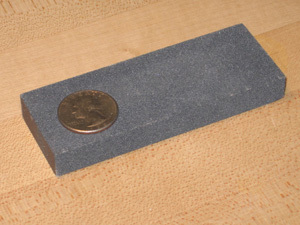 Whetstone for smoothing the edge of glass before putting the EconoSpace into a frame. Smoothing the edge of the glass in any frame job is a way of preventing the glass from shaving bits of wood, leaf or paint from inside a wood frame. In metal frames it helps keep the glass from chipping.